Mr. Izquierdo is a recipient of numerous awards. He is a winner of JoAnn Falletta International Guitar Competition in 2004, Extremadura International Guitar Competition, Schadt String competition, Stotsenberg International Guitar Competition among others. 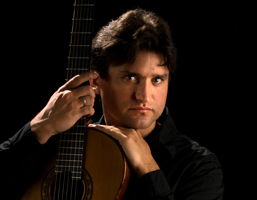 He is currently a professor of classical guitar at the Wisconsin State University in Milwaukee and an active solo performer and chamber musician. Rene has studied with Leo Brouwer, David Russell, Shin-Ichi Fukuda, Eli Kastner, Pepe Romero, Angel Romero, Carlos Barbosa-Lima, David Starobin, Eduardo Fernandez, Jorge Morel, Robert Beaser and Anthony Newman among others. “His natural and instinctive interpretations are second to none: his virtuoso technique allows him absolute command of the instrument giving him the independence of subtle phrasing, dazzling speed, beautiful tonal control… everything. – Classical Guitar Magazine, May, 10. ” Izquierdo is a very self-assured performer who demonstrated amazing technical and expressive command of the music he plays…” – Classical Guitar Magazine, Oct. 07. “…the command and character of his playing lived up to the impressive credentials. His sound carried the guitar- friendly Recital Hall with power to spare. His secure technique eliminated the usual clicks, muffles and buzzes. Speed was no problem for him. …Izquierdo is a painterly guitarist. He changes angle of attack in the right hand and moves it from bridge to fingerboard to produce a wide spectrum of sonic color. He applies it thoughtfully, to cast particular light on particular melodies…” – Milwaukee Journal Sentinel, Nov 20, 2004. “…Izquierdo is already a seasoned performer of great accomplishment. His tone is clear, warm and robust, his musicianship impeccable, and his desire and capability equally great…” – Eliot Fisk, 2003. “I have rarely seen a musical talent equal to Rene Izquierdo. He is a virtuoso guitarist and a profound musical thinker” – Benjamin Verdery, 2001. “Rene is without any question one of the finest young guitarist in the country” – Ransom Wilson, 1999. “Rene Izquierdo is one of the most promising young guitarist to come from Cuba, not only for his purist approach to technique, but for his artistic gift as an interpreter, giving him a voice of his own at such a young age” – Jesus Ortega, 1994.